Scorching summer heat can make upstairs living nearly unbearable. Sometimes AC Repair in Greensboro is inevitable. Even the best air conditioner in Greensboro has difficulty keeping upstairs spaces cool and comfortable. Why? It’s simple; because heat rises. To keep the upstairs cool in your home, utilize these easy maintenance tips. Keep upstairs blinds and curtains closed during the day. As the sun enters the rooms through windows, it can make the space feel several degrees hotter. Pale opaque shades and drapes are ideal for blocking sunlight. Replace single-pane windows. If you’re still living with single-paned window models, consider upgrading. Single-paned windows and window casings that leak allow hot air to seep in and make your AC work harder to cool your upstairs. Ensure that your attic is well-insulated. Attic insulation in Greensboro is essential for all seasons, keeping heat out in the summer and in during the winter. Opt for a minimum of R30 insulation to help keep attic heat from conducting down into the second-floor living spaces. Replace filters. When dirt and debris builds up on filters, they can become blocked, impeding proper airflow. This issue can have the greatest negative effect at the farthest reaches of the duct system, in other words upstairs. Filters should be replaced at least every three months, or more often if you have shedding pets. Close half of your downstairs registers. Opening all upstairs supply registers and keeping downstairs supply registers partially closed forces more cold air upstairs where it’s needed. Do not close all downstairs registers as some air is needed for the air conditioner to work efficiently. Unblock upstairs air return vents. Check upstairs air return vents to ensure none are blocked by furniture, drapes, rugs or other items. These vents should have plenty of room to create good air circulation throughout the upper floor. Call in a professional for maintenance help. 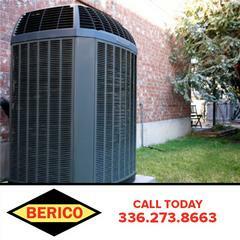 Contact Berico, a trusted Greensboro cooling and heating professional to survey your home. We can make recommendations on how to cool your upstairs spaces and will check for problems that are preventing effective cooling throughout the house. We can also provide air conditioning repair in Greensboro homes. If your bedroom feels more like a blast furnace than a relaxing retreat, it’s time to make some vital changes to your cooling strategies. For more professional advice on home cooling and heating services for your home, please contact us today.